The Whisky Exchange has now announced it’s best whisky for 2015. Of course picking a great single malt is never an easy job, but this year the Whisky Exchange people were able to narrow it down to a few factors: it had to be less than £60; it’s a current release and it’s bottled at non-cask strength. Surveys were taken from their staff, drinks writers and Scotch whisky experts. In the end a short list of 8 single malt whiskies were chosen. These were then offered in a blind test to 70 customers and votes were counted for which was the best. The winner is: GLENDRONACH Revival. 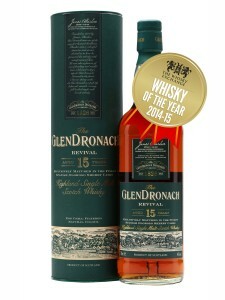 The Glendronach Revival is a 15 year old distillery bottled single malt Highland Scotch whisky. It has a rich intense flavour with strong hints of sherry. The strong sherry overtones give Glendronach it’s unique place among fans of sherried whiskies. This whisky is something to compete with even the best of Speyside whiskies. Long and dark, with sweet fruit slowly turning into rich woody spice. Have you tried this? What do you think? Join the discussion below by leaving your comments.